Paul Hegarty last night led tributes to former Dundee United director Derek Robertson who passed away after suffering from ill-health. United legend Hegarty paid Robertson a glowing tribute by describing him as the “perfect ambassador” after a long and enjoyable association with his beloved Tangerines which saw him move from the terracing to the boardroom. Robertson, who lost his fight against cancer, was forced to give up his seat on the board at the end of last season when illness meant he could no longer carry out his professional duties but the Tangerines always held a special place in his heart. Hegarty, who made 493 appearances for the Tayside club, had nothing but praise for the club’s well-respected director. Hegarty said: “I’m sad to hear of Derek’s passing. I would put him down as the perfect club ambassador who was totally focussed on what was best for Dundee United. “As everyone knows, the club was a very big part of his life and it was something he enjoyed immensely, whether it was watching them at Tannadice or somewhere in Europe where he travelled often. “He was the kind who preferred to work quietly behind the scenes for the good of the club. Derek was never one to be looking for the credit and I think that’s why so many people around the club respected him so much. No matter what job he was doing for the club, he took great pride in it. 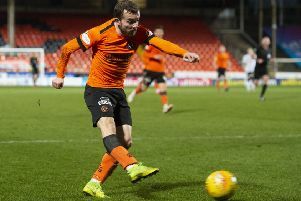 “He will be sorely missed by everyone connected with Dundee United. Having spent much of earlier life following United both at home and abroad, Robertson was appointed to the boardroom as a director in 2002, where he played a prominent part until his resignation. Once installed on the board, he proved influential in pushing for increased supporter involvement in the club he cherished so much. As a result of his passion, he helped successfully establish ArabTRUST, the Dundee United Supporters’ Society, while also playing a significant role in the development of the national fans’ body Supporters Direct. Derek took great satisfaction from seeing his favourite team prosper on the park, and few were more thrilled when they lifted the Scottish Cup by beating Ross County 3-0 at Hampden Park back in 2010. A club statement read: “All the directors, management team, players and staff at Dundee United are today saddened to hear of the passing of Derek Robertson. Stephen Thompson, Chairman of Dundee United, echoed Hegarty’s sentiments. Thompson said: “It is such sad news. I worked closely with Derek for 14 years and he was Tangerine through and through. Derek was a friend as well as a colleague and brought around much change at the club in his early years on the board. Hegarty, now the manager of Montrose, added: “Derek wasn’t just a great Dundee United man, he was also an extremely kind and generous man. If ever he could help any supporter in whatever small way, he would go out his way to do so.